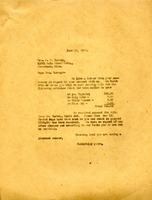 A letter describing and providing the price for a rug that Mr. Gavan had inquired about some weeks beforehand. 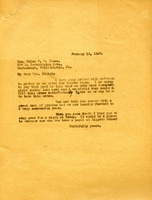 Letter to Mrs. P. W. Harvey explaining that Mr. Harvey already made the required payment and she does not owe the schools any more money. 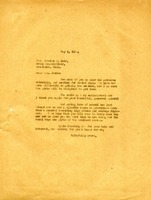 Martha Berry writes Helen Jones to tell her that Berry can not fulfill Jones' order for hooked rugs at this time because the girls working on them are inexperienced. 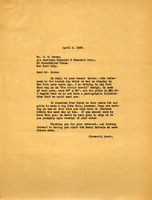 Letter to E. J. 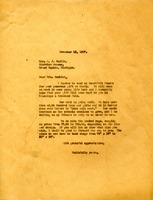 Gamble from Martha Berry sending her thanks for her gift to Berry. She then proceeds to tell Mrs. Gamble that their work at the Berry Schools is going well but that it's becoming harder to "make ends meat" and that their needs continue to grow. Miss Berry calls on her friends to help them as never before. Miss Berry informs Mrs. Gamble that they have hooked rugs ranging in price and that she will forward whatever size rug she wanted.